Summary: You may think me biased, being murdered myself. But my state of being has nothing to do with the curiosity toward my own species, if we can be called such. We do not go gentle, as your poet encourages, into that good night. Review: Well, I wanted a horror book to kick off October, and I definitely got one. The Girl from the Well delivers some of my favorite horror tropes: vengeful ghosts, serial killers, possession, and more. Not to mention a variety of terrifying and memorable ways of killing people. The main cast is an interesting mix: Tarquin, the boy with the creepy tattoos; Callie, his cousin; and the vengeful ghost. (Referring to the ghost by her name would be a spoiler as she’s based on a famous Japanese ghost story, so I’ll leave her nameless for the review.) I was very fond of how Callie became a big sister of sorts to Tarquin, especially since she never got as used to the ghost as Tarquin did, and the ghost often scared her/made her uneasy. Rin Chupeco’s strength lies in the ghost’s narration, even though it’s a bit of an odd style—almost, but not quite, omniscient. The ghost focuses on very specific, and often odd or unsettling, details that really help to make her character feel disconnected from most of the world. Of particular note are the occasional odd line breaks and counting, which were both used to varying degrees of effectiveness. Other details—such as names—aren’t all that important to the ghost, and it takes a great deal of time before she consistently refers to Tarquin by name instead of as “the tattooed boy” or Callie as “the teacher’s assistant.” I particularly enjoyed watching the ghost become more attached to the two of them as the book progressed, especially since she went from a more passive role (showing up briefly to lead the way) to an active one (actually fighting for Tarquin) in their lives. Chupeco did a good job of balancing the monstrous side of the ghost with the bits of humanity that were left to her. I wasn’t as fond of Tarquin’s parents. Tarquin’s dad seemed remarkably oblivious to pretty much everything that was going on, and I wish he had had more of a role to play in the story. As it was, he was essentially a vehicle to get Tarquin from one place to another. Tarquin’s mother, Yoko, was also more of a plot device than a character. I’m honestly not certain what to do with her other than to note that she was basically a “driven mad by guilt” character, and the book heavily tied her mental illness into her supernatural/spiritual abilities. The depiction of her (and the other patients at the mental hospital) left me with a bit of a sour aftertaste. Recommendation: Get it soon if you have a strong stomach for gruesome and creepy stories. 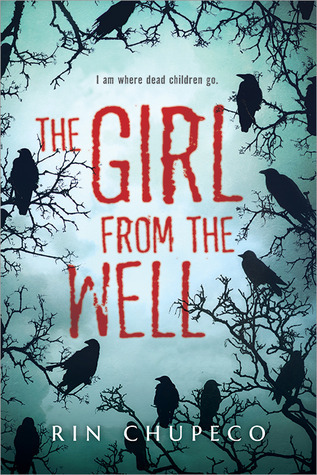 The Girl from the Well gets a lot of the details right when it comes to ghost-flavored horror, and the solid writing and fascinating narrator make for a great combination. The book is a fast and entertaining read, even if it does stumble from time to time. If you’re looking for something to read in the weeks leading up to Halloween, this would be a great choice. This book sounds very interesting. I’ll check it out!